I’ve been feeling mopey and nostalgic lately, which has driven me to browse through my Flickr photostream. I like to look back to the beginning, seeing how far I’ve come since establishing the account in late 2006. It’s pretty obvious that I had no idea how to use a camera when I began six years ago. 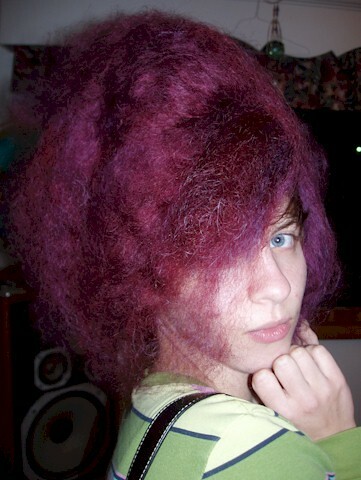 My first photo, a knitting project, was posted on October 29, 2006. The colors are washed out, it’s out of focus, and yes, those are my legs. Overall it’s pretty dreadful. Even though it’s a WIP, there is no way to tell what the project is supposed to be. 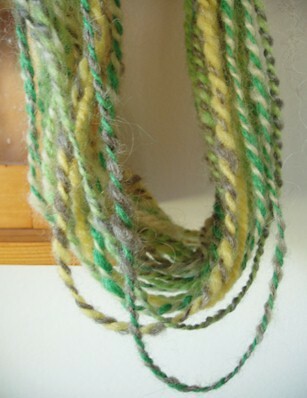 Also on that day I posted this image of some very early handspun yarn. 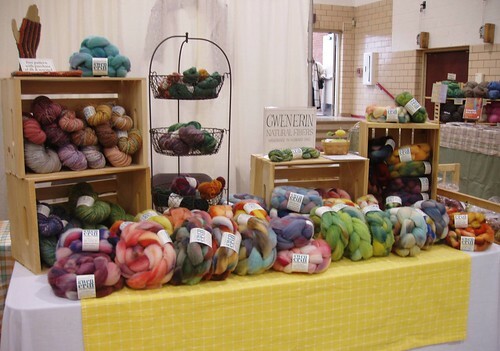 I remember being very proud of that skein. But the image is not flattering. Apparently I had not discovered how to focus yet. 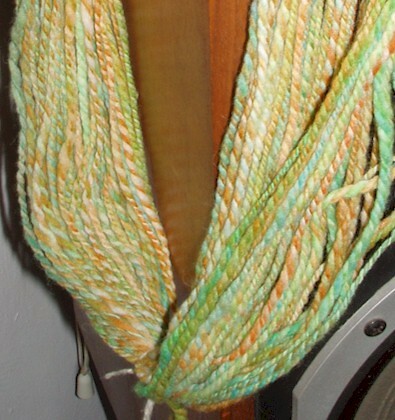 And you don’t really see much of the yarn itself. Here is another washed out gem. I must have been trying to work with natural light, but eventually went ahead and used the flash on this one. Overall it just looks sloppy and flat. I had hung the yarn on a speaker, probably thinking it would be artsy, but instead you are distracted by that weird grey thing in the corner. You can also see that I hadn’t decided on cropping the photos to a specified size. I remember being annoyed that the pictures on the page weren’t lining up, so I eventually settled on cropping everything to 10 x 8. I prefer it when things match. Question: What are the earliest images of your craft that were posted online? Did you start off knowing how to use a camera? What techniques have you improved upon since getting started? Include links to your photos if you like. I’ve been working on the organization of the wool room for three days straight. Actually, it’s been four days, counting the clearing out on Sunday. And I have finally reached a point where I feel good about it. It’s not perfect: there are still piles of to deal with and totes that need individual attention. 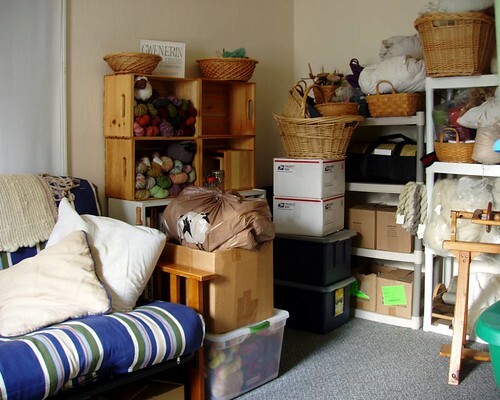 But in the nearly two years we’ve lived in this house, this is the most organized my wool room has been. I suppose it would be more impressive if you had seen it before I cleaned up. Yikes. I found a few things I’d forgotten about including an entire tote’s worth of dyed top; my needle felting tools; a kit for this pattern (which I distinctly remember failing to create due to my confusion regarding yarn-overs); 1000 more tote bags; Rich’s yarn stash; more fiber; more yarn… If you can’t get to the stuff, how could you know what you’ve got? Also, I can see the floor again, which I had forgotten about. I was able to vacuum in there for the first time in months. 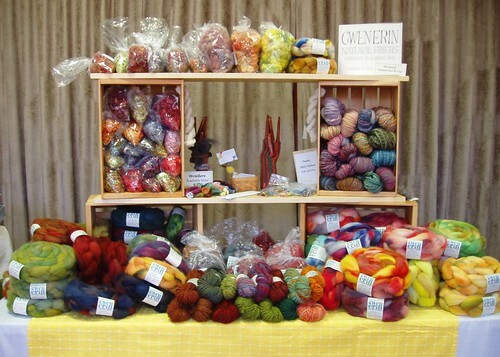 Anyone want to stop in for some knitting or spinning? There’s a couch! And space for sitting! 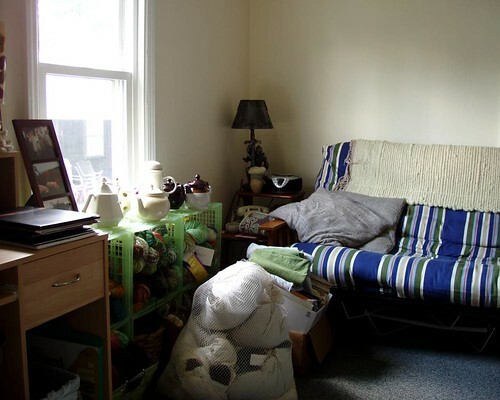 And room for projects! And an end table with a lamp! 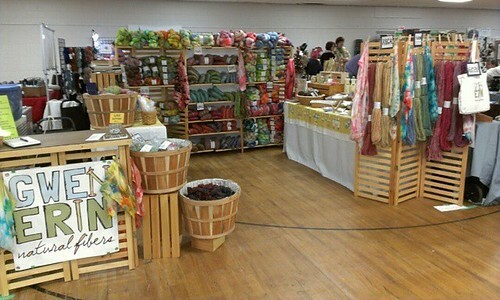 And lots of boxes, baskets, and totes to snoop around in! Come on! I can hardly believe another year has already passed. They always say that time goes faster as you get older and I’m beginning to see the truth of that statement. I am pleased with what I have accomplished this year, checking several things off my “big things” to-do list. Pay off my student loan. Officially student-debt free as of October. 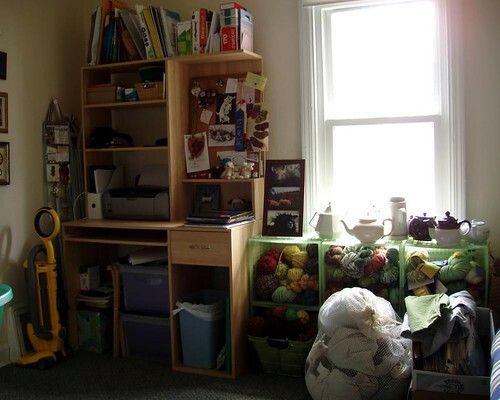 Organize the wool room. We did do that, but now it has fallen into disarray again. Maybe a better goal is to organize it and keep it that way. 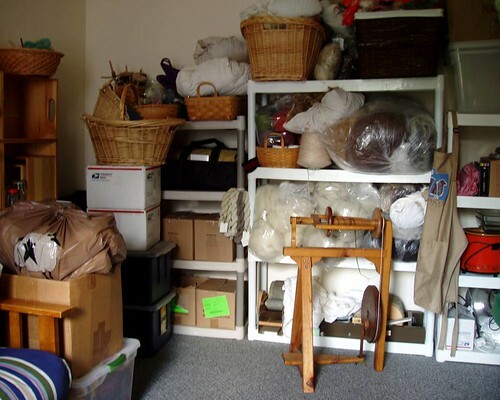 Of course, that would require all those random items that drift into the wool room to find a better home. Keep track of my business finances better. That is still a work in progress, but I’m on the right track. At least I have a file box for receipts and documents. Apply to more festivals/shows. The final total was seven, up from two the previous year. Knit a new hat for my mom. 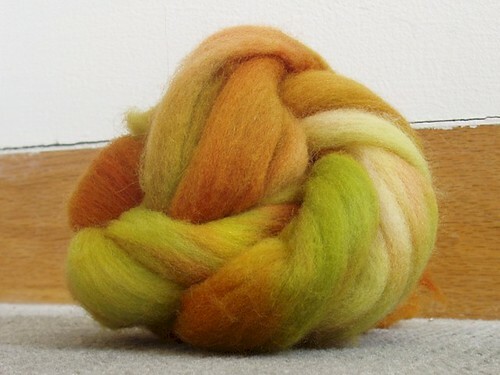 Finish dyeing the remaining Cotswold and Corriedale-Lincoln locks. Register my business name with the State of Ohio. Relabel everything using tags with my new logo. 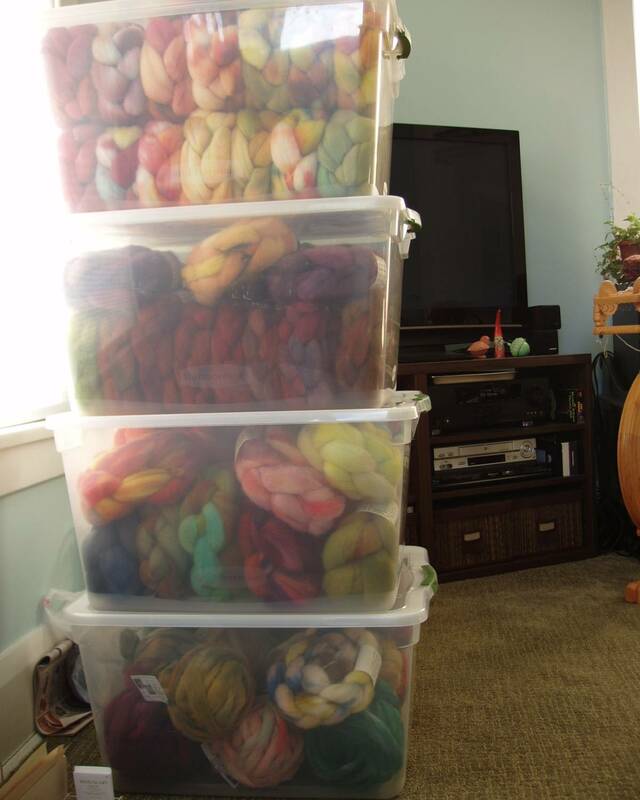 Organize a fiber club – possibly locks? Compile and release a collection of mitten patterns. Update Etsy shop more regularly. Knit a new pair of socks. Buy a larger number of fleeces. Question: What are your goals for 2012? Are there specific projects you want to make? New techniques you want to learn? Something really big and exciting you want to embark upon? Literally! 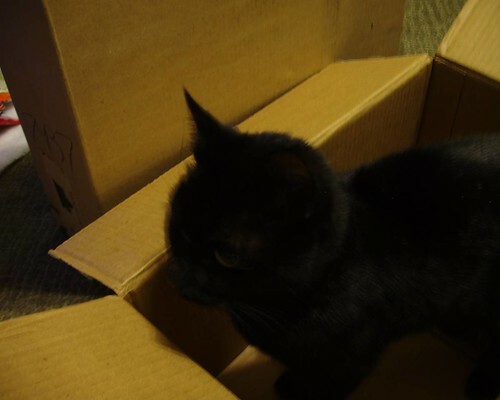 I got home from archery practice tonight and ran into the living room where two large boxes were waiting. Not fleeces (sad face), but something else that is equally exciting! I have been anticipating their arrival since last Thursday. 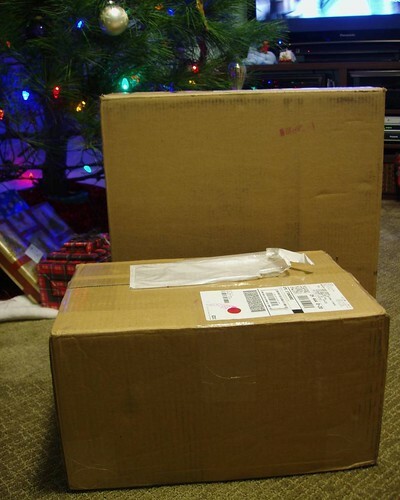 So what is contained in these mysterious boxes? Why it’s Eucalan! 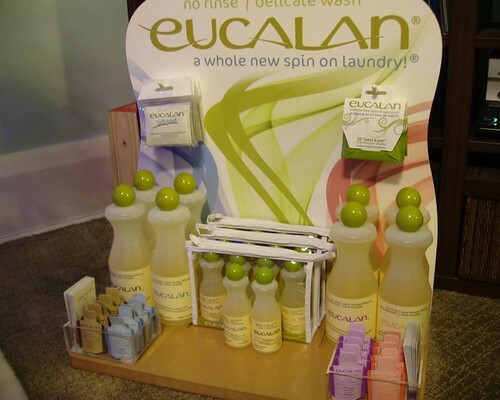 Lots and lots and lots of lovely, fragrant Eucalan Delicate Wash! 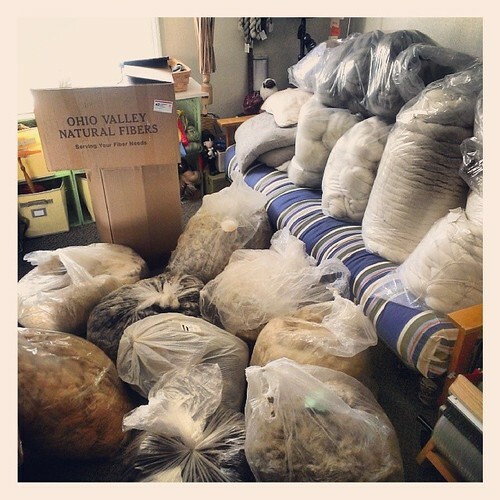 After using this product for several years on everything from nylon stockings to grandma’s quilt (not to mention every wool item I own and have ever made), I decided to inquire about a wholesale account. Why not start offering it with all the other goodies at my booth? 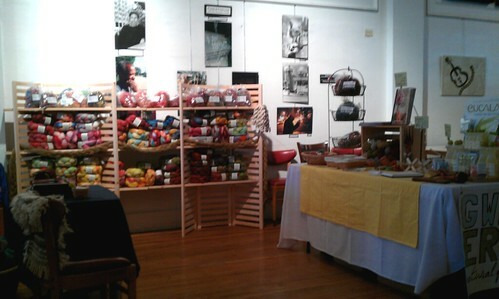 What could be better than to give a gift of mittens or yarn and include a bottle of wool wash along with it? I decided to start out with a bang and ordered their Starter Kit, which contains a sampling of almost everything they sell. 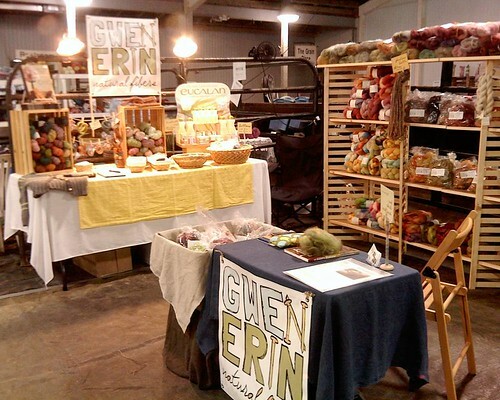 Wool wash in three sizes: sample size, small bottles, and large bottles; stain wipes; lint remover sheets; gift packs; brochures. It also comes with a display. The great thing about this is that it is flexible, just like every other aspect of my set-up. 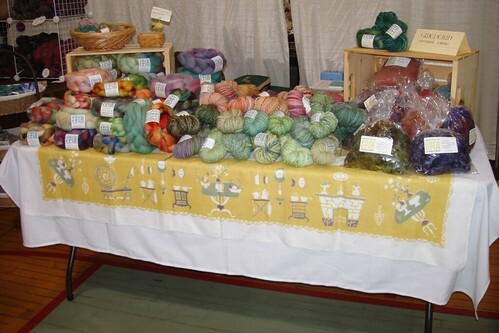 If I have plenty of space, I can bring the whole display; if I have a small table, I can bring just a few items. I’m excited to be part of the Eucalan family now! Wool wash anyone? 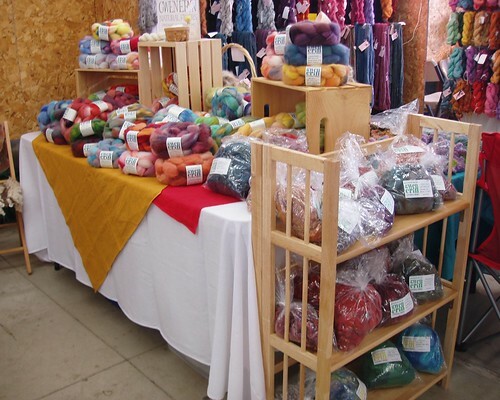 When I first started knitting, I felt compelled to hunt down every single yarn shop within an hour’s drive and visit them all. Rich would ask, “Where are we going this time?” And then we’d hop in the car, driving off to some unknown town (pre-GPS) simply to check another shop off my list. Of course I had to buy something since we’d gone to all that trouble to get there. In fact, I’d feel rather guilty if I didn’t. 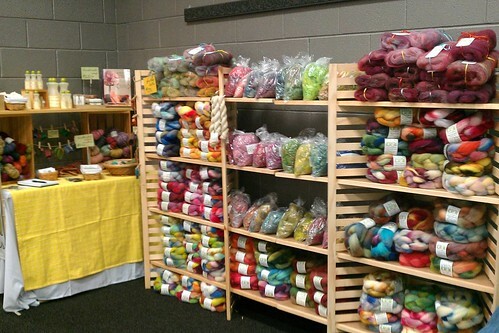 Eventually I wandered away from purchasing commercial yarn and started spinning. Finding shops with fiber and wheels was much more difficult. I would scour the ads in Spin-Off, hoping to discover some previously unknown gold mine. Occasionally something would pop up, so off we’d go again, and I would feel compelled to buy. 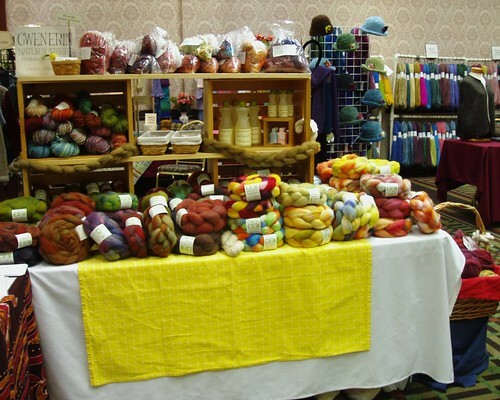 Then I found out about fiber festivals. These are considerably more exciting for the spinner/multi-hobbyist. At first I would come home with gobs of stuff, but it has slowed down recently. I look at all the lovely things and hesitate to buy. 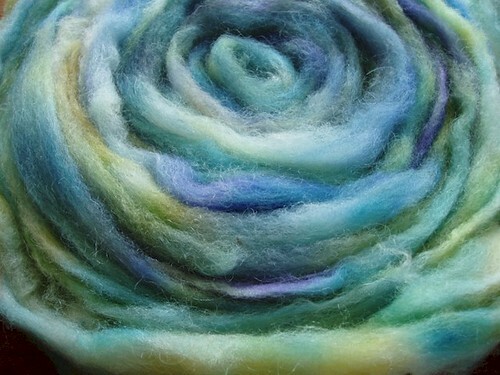 As a dyer and spinner, I appreciate what others are doing, but I want to go home and do it myself. That’s when I realized why I feel so drawn to vending. I want to be a member of the fiber community, but being purely a consumer is not enough. By creating and selling, I can still enjoy attending all the different events, without the pressure to purchase. Instead I am the one putting that pressure on other people! Additionally, I have become much more aware of fiber content. 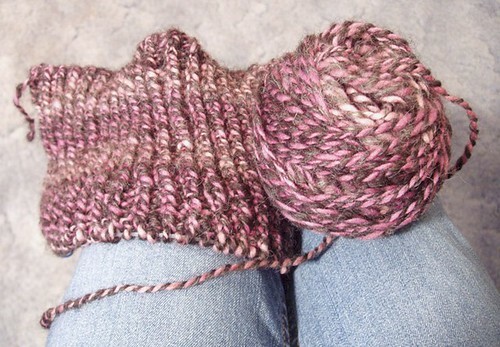 I began with acrylic yarn. Not just that, I was excited about it. But then I discovered wool and decided to stick with it. Now I am very interested what type of wool, what breed I am buying. The more you know, the more you want to know. 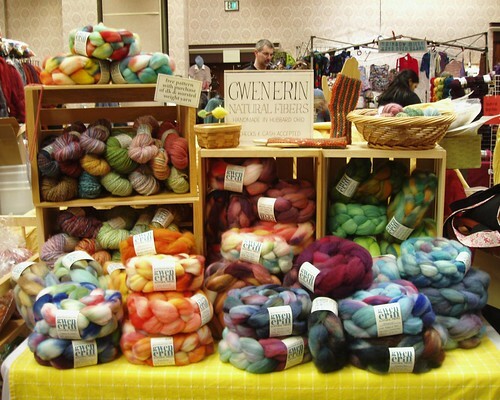 Question: How has your interest in fiber arts changed over the years? Do you focus on one aspect more now than you did before? Have you become disinterested in a particular thing?